The head offices of SNC Lavalin are seen in Montreal, on Feb. 19, 2015. SNC-Lavalin Group Inc. has stopped bidding on mining work and reduced its profit expectations for the second time in two weeks after failing to resolve a dispute with a key customer in South America. Montreal-based SNC-Lavalin said in a statement on Monday it has halted all bidding on future mining engineering, procurement and construction projects. The move is one of several by the company as it tries to resolve unexpected problems on a mining contract with Chile’s Codelco, the world’s biggest copper producer. It also negotiated new debt covenants with lenders. 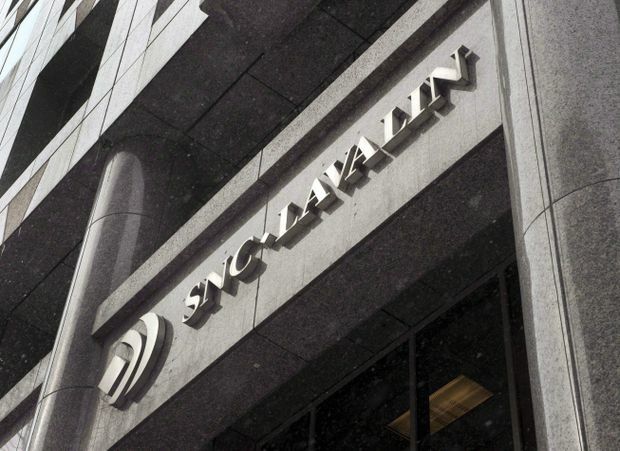 Due to the negative impact from the project, SNC-Lavalin could book a fourth-quarter 2018 loss of up to $350-million in the mining unit, the company said. That in turn would hurt overall annual profit, which is now expected to come in between $1.20 and $1.35 a share for 2018, the company said. That is down from a previous forecast of $2.15 to $2.30 a share. Investors pushed down SNC stock another 7 per cent in afternoon trading in Toronto, to $34. The development is the latest in a growing list of problems for SNC-Lavalin chief executive Neil Bruce, who is also dealing with the corporation’s increasingly politicized legal trouble and uncertainty about its future business prospects in Saudi Arabia. Shareholders, impatient for a resolution to the corruption and fraud charges the company faces, are also beginning to question its strategy. Confidence in SNC management was shaken on Jan. 28, when the company first disclosed trouble with the mining contract and said it would write down the value of its oil and gas division by $1.24-billion. The company lost $2.4-billion in market capitalization that day, exposing it further to a takeover. SNC’s future became more complicated last week when The Globe and Mail reported that the Prime Minister’s Office and other government officials attempted to press Jody Wilson-Raybould, when she was attorney-general, to direct the Public Prosecution Service of Canada to settle the charges with SNC-Lavalin. Ms. Wilson-Raybould declined to do so, according to sources, and was later demoted. The company has declined to name its mining client publicly. But Mr. Bruce confirmed to The Globe earlier this month that the company is struggling with cost overruns involving the construction of two sulphuric acid plants for Codelco. He described the problems as “isolated,” a characterization the company repeated on Monday. After further negotiations and discussions with the client, the two parties will settle the matter through an accelerated arbitration process, SNC said. The company said it expects to recover significant funds in the future in the dispute, but that in the near term, it cannot reach the necessary agreement with the customer to meet international financial reporting standards for revenue recognition. The main challenges on the mining project include unexpected site conditions, environmental and safety measures and underperformance from subcontractors, SNC said on Monday. Work continues with a view to completion in the second quarter of 2019, the company said. SNC added that it has discussed the cash flow impact of the mining project with its lenders and negotiated new temporary terms on its outstanding debt. Under the amended agreement, SNC must maintain a ratio of net debt to earnings before interest, taxes, depreciation and amortization of not more than four times, up from 3.75 times. The ratio is a measure of the company’s ability to pay off its debt. The projected loss on the mining project will also be treated as a non-recurring item, up to a maximum of $310-million, the firm said. SNC-Lavalin said it has no plans to raise equity and that it is not in breach of any debt covenants. The company said it has nearly $1.8-billion in available liquidity under current credit agreements. The engineering firm also issued initial financial guidance for 2019 on Monday, saying it believes profit per share for its engineering and construction business will come in between $2 and $2.20. That’s lower than the $2.60 a share analysts had expected. Total earnings per share, including returns from infrastructure assets such as the company’s stake in Toronto toll road Highway 407, should come in between $3 and $3.20, the company said. Analyst Maxim Sytchev of National Bank of Canada said the Canadian engineering giant should consider selling its oil and gas and mining businesses and rethink its plan to grow its sales in the years ahead in light of its declining share price. Mining, which made up 4 per cent of the company’s $9.3-billion in sales for 2017, has not followed the company’s positive move toward more cost-reimbursable work and away from fixed-price contracts, he said.